It started with the toss of a coin - as all fiercely fought sports matches do. 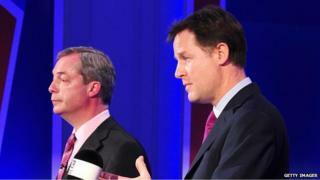 This was a political showdown pitting pro-European Nick Clegg against the Eurosceptic Nigel Farage in a live TV and radio debate. The question of the hour, should Britain stay in the European Union? But the question now being asked? Who won, Nick or Nigel? Well, it might be disappointing but both men certainly remain standing after tonight's event. Neither was knocked to the ground and both sides will be pleased with how their leaders performed. Nick Clegg, a seasoned pro after the TV debates before the 2010 general election, remained calm and relaxed certainly playing the cool card. Nigel Farage put in a passionate performance, on the attack and more aggressive in his rhetoric. This was not simply a TV and radio debate - forget the studios - this was pitched at the public beyond the screens and the airwaves. After winning the toss of a pound coin (not a Euro!) Mr Farage invited the Liberal Democrat leader to "open the batting". Staring straight into the cameras to make his pitch, the deputy prime minister insisted that Britain was "better off in Europe - richer, stronger, safer", but the leader of the Eurosceptic UK Independence Party told viewers that, if there were a referendum now on whether the UK should enter the EU, "you wouldn't join it". As the debate ranged across issues like immigration, benefits, jobs, an EU referendum and gay marriage Mr Clegg stuck to statistics to make his argument whilst Mr Farage plumped for emotional rhetoric. One of the laughs, albeit a small one, came from a Mr Farage comment naming a plus for Europe, "for one thing, the food's getting better here, and that's great". As for the chemistry between the pair, both sporting magenta ties, they couldn't bear to look at each other, eyes fixed firmly on the studio audience or TV cameras. One things for certain this was a great platform for both men to shore up their votes and to entice the undecided ahead of May's European elections. But we should remember this debate doesn't change the fact that the earliest a referendum on Europe will take place is 2017 and that is far from guaranteed to happen. It may be a score draw tonight but there's still another round to come. We may see more of a convincing winner next week in the BBC's own debate.